Factory Discovery 2 front driveshafts are a very high quality shaft. The premature failure issue with them is related to excessive heat, not the quality of the component. Upgrading them is frequently the most cost effective alternative to outright replacement. 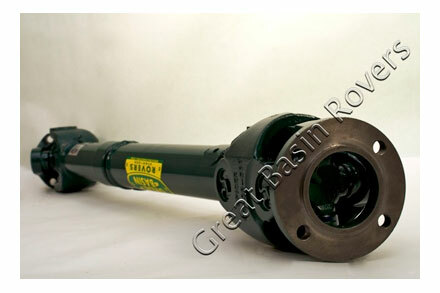 Our driveshafts are fully serviceable, incl. u-joints and centering kits – GBR Exclusive. 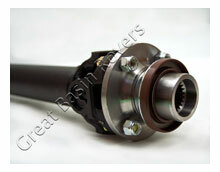 We have a full line of custom built, double cardon front driveshafts utilizing heavy duty spicer components. We can build any custom application. Call for your special requirements. We offer a very cost effective Roto-Flex Coupling elimination kit. Since we are a driveshaft remanufacturing facility we can modify existing Roto-Flex rear driveshafts to a u-joint model. 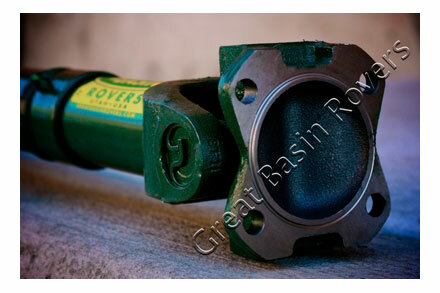 What we do is to cut off the three bolt Roto-Flex weld yoke and weld on the appropriate Spicer 4 bolt weld yoke. We add a Spicer 5-153X u-joint and a Spicer flange yoke and presto – an economical u-joint rear driveshaft! During this process we also thoroughly inspect the other components such as the other u-joint and replace it if necessary. In addition we inspect and clean the slip and spline joint. The shaft is also rebalanced. We also supply a reconditioned pinion flange along with a new pinion seal of the latest design with the matching mud shield, the appropriate pinion preload spacer and 4 new driveshaft nuts and bolts. You can purchase a lower cost RFC elimination kit but you will need to contact a salvage yard and hope that the parts they supply are in good condition and everything is included. If you don’t want to deal with that hassle, give us a call. * final retail price after $25 core credit applied, which is refunded upon receipt of rebuildable core drive shaft. We also will consider purchasing outright any existing RF rear driveshafts. Contact us for details. Above price is for 2.5″ diameter tube, we also have a 3″ diameter tube for $595.95. Land Rovers have some unique front driveshaft issues which we will summarize here. This is not a full technical discussion but rather a “brief” overview. Front Driveshafts except Discovery 2 – when Land Rover was designing the original Range Rover Classic back in the late 1960’s and yes, surprisingly this vehicle shares the same basic drivetrain layout as even some of the latest Land Rovers products. 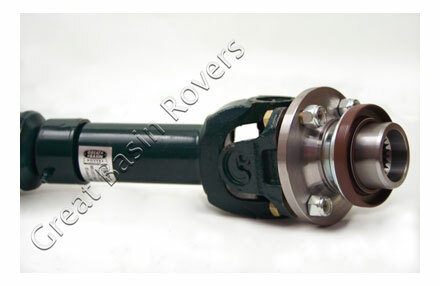 The original design called for a double cardon front driveshaft because Land Rover pointed the front differential up, resulting in unequal u-joint angles on both the front and rear of the shaft. If you know your Land Rover history, this was during the period that Land Rover was nationalized into British Leyland. BL in the quest to improve the profitability of it’s acquisitions looked closely at various aspects of the vehicles. A cost accountant questioned the need for a relatively expensive (at the time) double cardon front driveshaft. A less expensive solution was implemented which was to clock the respective u-joints out of phase approximately 40 degrees to allow the u-joint ocillations to cancel themselves out. This was an acceptable engineering solution and successful but it has one major side effect. It makes the front driveshaft very sensitive to even minor changes resulting from things such as minor suspension lifts. The most common symptom is a “growling” noise at neutral throttle at higher road speeds. Neutral throttle is also known as drivetrain float i.e. you are not on the throttle (accelerating) or off the throttle (decelerating). In other words the drivetrain is in a “float” conditition. The growling condition is quite pronounced and is actually the rear u-joint of the front shaft experiencing a high frequency vibration. In addition to being quite irritating, it results in premature u-joint wear. There are several things you can attempt to do to eliminate the problem but the most effective long term solution is to upgrade to a double cardon driveshaft. Discovery 2 Front Driveshafts – As we are fond of saying, Land Rover finally added a double cardon front shaft but unfortunately it was 29 years too late! To complicate matters, it is a good news/bad news situation. We already mentioned the good news – they did it. The bad news is that someone at Land Rover decided to make the double cardon joint non-serviceable. Non-serviceable u-joints are becoming quite common on many modern vehicles but we question the choice on a four wheel drive vehicle especially one with Land Rovers reputation for off road prowess in condition such as wading in water and mud. The really bad news isn’t that it is non-servicable but rather it is located in close proximity to the catalytic converters. Catalytic converters become quite hot when they come up to temperature (approximately 700 degrees). Combine this with sitting in traffic (no air flow under the vehicle) in a hot climate (worst case scenario) and the lubrication in the shaft starts to degrade. Since there is no convenient way to lubricate the shaft and Land Rover doesn’t list it as a service point, it is overlooked. To make matters even worse the air conditioning compressor drains onto the joint! The result is premature failure of this driveshaft. Unfortunately as the driveshaft deteriorates it frequently does not have an ominous warning sign of the looming failure . This means that you frequently find out about the issue as you are driving down the road at a higher rate of speed. The results are usually catastrophic. The shaft breaks in two and the longer heavier piece flails about destroying exhaust system and ends with it usually knocking a hole in the transmission! The solution to this issue is to upgrade to a serviceable shaft and service it regularly and frequently especially if you are in a worst case scenario. We offer a couple of options to deal with this problem. If you have one of these vehicles and you start to pick up any vibrations or clunking or sqeeking noises or any combination of them – immediately inspect the front driveshaft. The consequences are so dire you might consider immediately stopping driving the vehicle! A minor problem this shaft has it that it also throws balance weights which results in vibrations., which frequently mimics the major problem.